Do you remember when you were in 6th grade and learned all about sentence diagramming? Most kids are taught to draw a horizontal line and split it into two parts, with the sentence subject on the left and the predicate on the right. Then come the modifiers, hanging diagonally off of the original line, and… well, it only gets more complicated from there. I was one of the few students in my class who thoroughly enjoyed diagramming sentences, especially when they were complex. I would stay in the classroom during recess with my friend Maria and my teacher, Ms. Bergen, to practice diagramming “challenge sentences” on the whiteboard. My classmates would return, confused, to find a board covered in a seemingly nonsensical mess of colorful lines and scribbled words. Now I wonder if there was a better way to help me retain what I learned and get students who weren’t connecting with the material more involved. 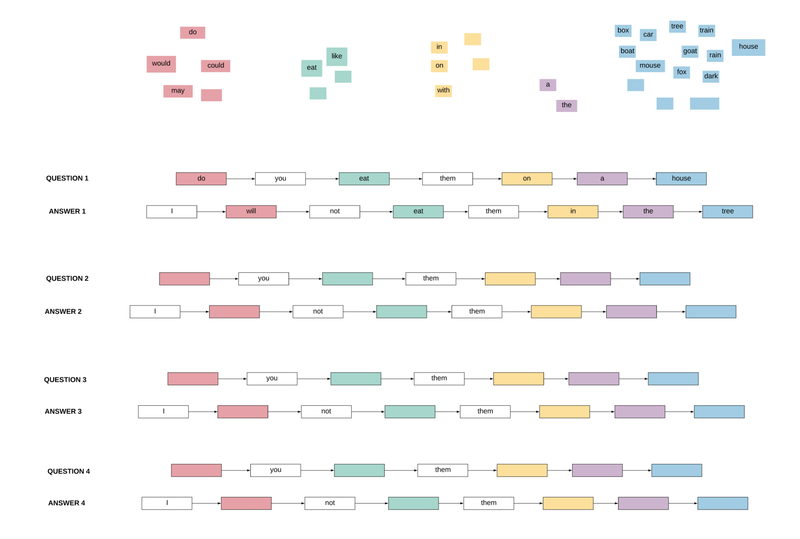 Diagramming sentences: is it helpful? For decades, educators have been debating whether sentence diagramming helps students learn to read and write. After it was invented in the late nineteenth century, sentence diagramming flourished in the American classroom for about fifty years, alongside other structured grammar-teaching tactics. But then the voice of the skeptics emerged, arguing that sentence diagramming is a useless practice that hinders rather than aids students in their process of learning the English language and claiming that students best learn through imitation and immersion. While immersion and imitation of a language can produce strong speakers and writers, a basic understanding of grammatical structures can be a powerful writing tool. It can also be a helpful foundation for students to understand new languages. But all of this is only possible if teachers can successfully engage students in the learning process. 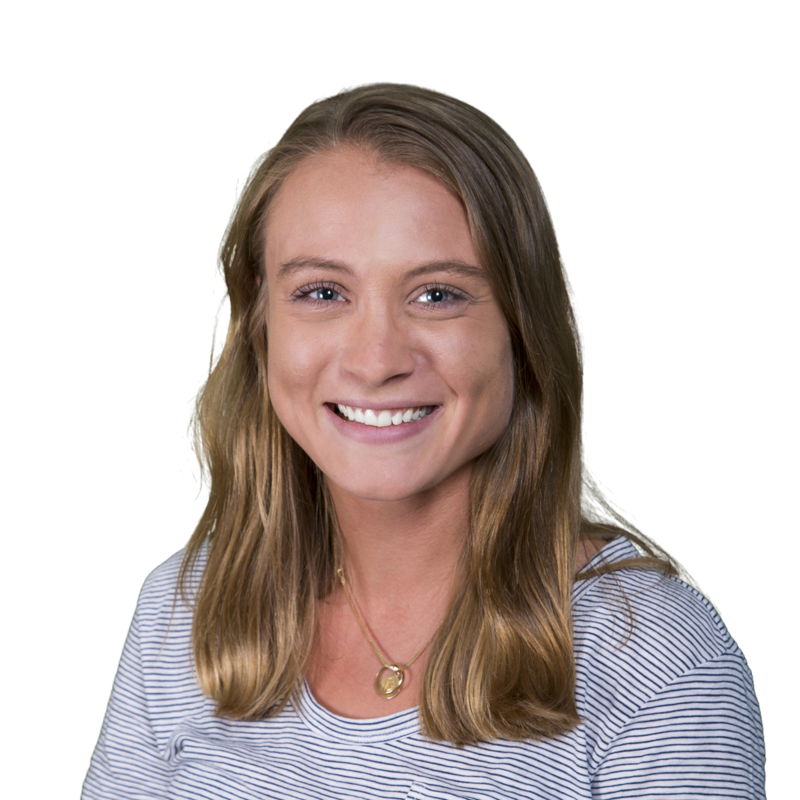 So why aren’t students motivated to learn the rules? I think it’s partially because we’re not presenting grammar in a more flexible, creative way at an early age. 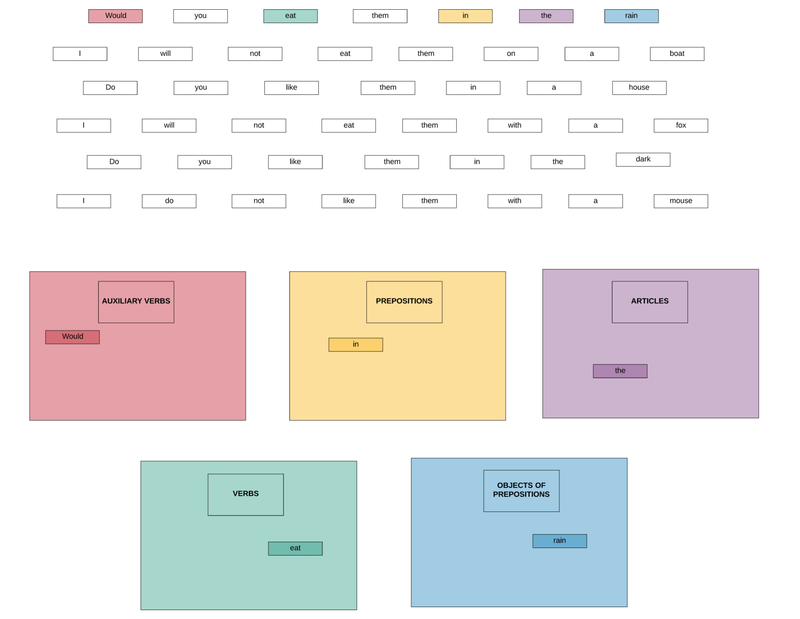 One of the easiest ways to get students engaged and provide them with a creative outlet when they’re learning about grammar is to use Lucidchart, a diagramming platform that’s free for students and teachers to use. Lucidchart is a perfect tool for teachers to make grammar visual and provide students with opportunities to express their creativity as they learn the rules. Read on for a fun, engaging lesson plan that grade-school teachers and parents can use to diagram sentences with their students in conjunction with reading and writing lessons. To see this in the context of an elementary school lesson plan, keep reading! To modify this lesson plan for other grade levels, select age-appropriate texts, and modify the template as needed. 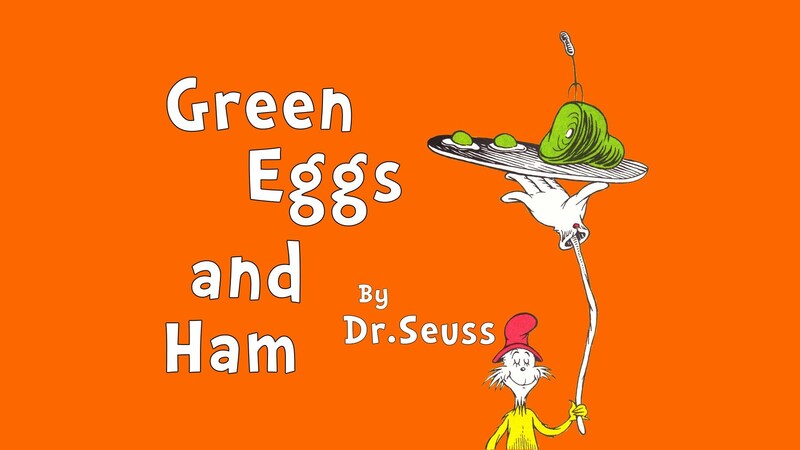 Because of its repetitive structure, Dr. Seuss’s Green Eggs and Ham is a great book to use to introduce students to grammar basics. Consisting of just 50 unique words, this book follows a simple question-and-answer exchange between two characters—the famous Sam-I-Am and a bitter fellow named Joey whom Sam is trying to convince to eat green eggs and ham. The simple and repetitive sentence structures in this story provide students with a solid framework for understanding and experimentation when it comes to diagramming sentences. Lesson Objective: Students will be able to categorize parts of speech and build sentence diagrams while exploring grammatical structures. What words, or strings of words, are repeated in the text? What words, or strings of words, are used by Sam and not Joey? What words, or strings of words, are used by Joey and not Sam? Now that students are familiar with the text and have started to identify patterns through repetition, they’re ready to start categorizing the words by parts of speech. After a brief refresher on parts of speech, students can drag the words from the sentences into the boxes that correspond with their parts of speech. This exercise helps students practice to recognize parts of speech and serves as helpful preparation for sentence construction. In the next part of the lesson, students will be able to diagram their own Dr. Seuss-style sentences to see how the parts of speech fit together. They’ll also be able to learn that English generally follows a consistent sentence structure—noun, auxiliary verb, verb, preposition, article, object. To do this, students can refer to the third tab of the template where they will find three question-and-answer pairs with certain parts of the sentence that are missing. Encourage students to drag-and-drop various words into the empty spaces to create sentences. Encourage your students to be creative with this part of the lesson, and read the sentences out loud after they compose them to see if they make sense. If they create nonsensical question-and-answer pairs, make sure they pay attention to why the questions and answers do not make sense. Is it because they have created an unrealistic scenario, such as eating eggs on top of a goat? Or is it because the words do not fit together at all, such as in the question, “would you eat them in a dark?” As students experiment, they will start to see the value of grammar and putting the correct parts of speech in order when it comes to constructing meaning. Another good way to help students understand how closely grammar is related to meaning, is by asking them to draw a picture of the scenario they have created. While a picture could easily be drawn of someone riding a goat while eating eggs, it would be difficult to depict someone eating eggs in a dark. When students become comfortable creating sentences by dragging existing words into the template sentences, you can invite them to fill in the blanks with their own words, and create their own make-believe scenarios to fit with Dr. Seuss’ playful plot. They can then read through their creations in pairs, just as they did when they were reading the book at the beginning of the lesson. With the help of the interactive Lucidchart platform, the students will excitedly discover that by playing with the formal elements of the English language, they can become storytellers as creative and meaningful as Dr. Seuss!